Since Bangladesh is a member of LDC (Least Developed Country). It has a population of about 150 million. It’s GNI is US$599.Literacy rate 65% and 52.5%(above 7 years). Unemployment is a massive problem here. A large number of people are unskilled or semi­skilled. So in maximum cases they are unemployed. Population is increasing day by day but job sector is not expanding to provide the unemployed people and because of lack of skill they are not able to take part in national income. But if we are able to ensure training, the unskilled people will become the wealth of the country and will be able to export manpower abroad and earn remittance. Bangladesh is one of the labor exporting countries in the world. Due to very limited employment opportunities within the country special emphasis is given to enhance scope for overseas employment as tool to accelerate pace of poverty alleviation activity. To keep pace with the rising demand of labour Bangladesh has ample scope to send her skilled, half-skilled and unskilled labour force there. But there many impediments from the Govt. and recruiting agencies. Moreover, lack of training, cheating ,illegal and lengthy process of migration .non-co-operation from embassy are daunting the potential flow of remittance and thereby economic development. 4) How to utilize remittance in productive sector. To depict the subject matter vividly the term paper assembles so many information from different sources. It flashes back to the manpower export, shows it’s role in socio-economic development, problems in manpower export, prospects of the export, present scenario, steps of the government, statistics and last of all recommendations. Considerable data have been collected for preparing this term paper. Necessary data are collected from newspapers, journals. The research work is accomplished with secondary data and through deductive method along with analyzing the data. Manpower By manpower we mean active capable matured people. Manpower Export The number industrious matured people needed or available to do a particular job manpower in foreign countries for employment. Problems Hindrance to man power export. Prospects Potentiality of manpower export in socio-economic development. Scarcity of relevant materials was problem for the successful completion of the paper. Sometimes I had to depend economic review, journals etc. The statistical data have been collected from MANPOWER EXPORT BUREAU, BESSEL, BAIRA. go all the data relevant with the task helped me to prepare the term paper. The term paper tends to highlight the problems and prospects of overseas manpower export. But necessary data, time, financial support were not enough. Limitations regarding practical experience limits the pace of the work Despite these restraints information from internet gives the work a solid base. I confidently believe that it will help to uncover the new findings related to the term paper. Able adult and active population of a country is considered as manpower. Fulfilling the need of the country seconding the surplus manpower in foreign countries for financial benefit is manpower export. International market demands skilled manpower since it is highly competitive. But 47.40% of our labours are un skilled. For this the unskilled labours have to work in lower wage and that is why the country cannot keep pace with expected labour market. AS a result exporters are losing interest over our labour market. Many labours are going abroad illegally .So they become illegal labours there. They cannot take help of law enforcing agencies of the country and have to suffer miserable condition. Due to lack of clear policy on manpower export many problems occur. As we have no reliable data of labour demand out side, Bangladeshi labours are losing jobs. It is along time accusation that foreign missions are not so helpful to distressed labours . Also indifference of the missions, lack of training of the officials absence of communication with the labours are responsible for it. In the hand of brokers and subagents of the recruiting agencies scattered in every nook and corner of the country many people are becoming completely void. Manpower is in the verge of destruction They are demanding more money than is required for sending people abroad. The cannot assure employment there and so labours have to under go cheating. Sometimes there passports are taken away from them. More over they do not get declared wage and opportunities. Recently in Kuwait labour unrest has caused demanding wage increase. It resulted in damaging cars and high commission. So Kuwait government sent them back empty hand after torture. The same thing happened in Malaysia and Kingdom of Saudi Arabia (KSA). Manpower export has every potentiality to be the major source of GDP. We have surplus population .On the other hand developed world is in shortage of workforce. They need to engage more people to sustain the development. We can take the opportunity and send people there to get rid of unemployment problem. A flow of remittance can also play an important role in eradicating poverty. So this sector requires and demands due attention. A sizeable number of Bangladeshi professionals, skilled, semi-skilled and unskilled labor force is employed in different countries including the Middle East. Overseas employment and workers remittances contribute significantly to the economic development of the country through reduction of unemployment and augmenting foreign exchange reserves and income. With a few exceptions, man export has been increasing every year. A total of 2.77lakh Bangladeshis had gone broad for employment in Fiscal year 2003 – 04, which is 10.36% higher than previous year. The number stood at 2.50 lakh in FY 2004 – 05, which is 9.75% lower than FY 2003 – 04. In FY 2005 – 06, manpower exports reached 2.91 lakh, which is 16.27%higher than previous year. In FY 2006-2007 manpower exports reached 5.64 lakh which is 93.81% higher than previous year. During 1976 to April 2008 manpower having strength of about 56.86 lakh has been exported. During 1976 to April 2008 Manpower having strength of 56.86 lakh has been exported. 8.33 lakh Bangladeshis had gone for employment is the year 2007, which is 118.27% higher than previous year. first tem months of FY 2007-2008 the manpower exports reached 7.92 lakh which is 88.25% higher than previous year, Up to May 2008, 57 lakh 68 thousand 748 people have been exported aboard. In June 2008 record 98 thousand and 2 people have gone aboard. In case of manpower export of 32 years it is the highest in one month. Considering the total manpower export up to April 2008 it is seen that more than 80% manpower have been exported to the middle East. In FY 2007-08 is the UAE is the highest in manpower import from Bangladesh. Besides, Bangladesh is exporting number of remarkable manpower to south Korea. After 10 years later Malaysia starts its manpower import from Bangladesh. Similarly expatriate worker’s remittances flow has been showing increasing trend day by day. It may be noted that in FY 2004 –05, the remittances from expatriate Bangladeshi workers stood at US $3848.29 million reflecting 14.13% rise over the previous year. In FY 2005 –06, remittances stood at US$4801.88 million reflecting 24.78% rise over the previous year. And in FY 2006-07 the remittance stood at US$ 5978.47 million and April 2008 it stood US$ 5649.23 million. The continuous augmentation in workers remittances is mainly due to the increase of skilled manpower export and the creation of facilities to send remittances from abroad. Source: Bureau of Manpower, Employment and Training and Bangladesh Bank. The amount of remittances in terms of GDP and export earnings has also increased. In FY 1999 –2000 remittances as percents of GDP and export stood at 4.14% and 33.89% respectively in FY 2005-06 remittances as percent of GDP and export stood at 6.89% and 45.62% respectively. In FY 2006-2007 remittances as percent of GDP and export stood 8.74% and 49.09% respectively . Source: BBS, EPB, Bangladesh Bank. Major share of total remittance come from the countries in the Middle East. But individually the position of USA is just behind Saudi Arabia over the few years. It is observe that from the pie chart that in FY2006-07 as usual the highest (30%) remittances came from Saudi Arabia. In the total remittance, the share of remittances from USA, UAE, UK and Kuwait are 16%, 13%, 15% and 11% respectively. It would be observed from the statistics of Bureau of Manpower Employment and Training (BMET) that during 1976 to June, 2006 period, about 43,37,187 Bangladeshi got overseas employment. Out of them,4.08%are professional worker, 33.42% are skilled worker, 15.49% are semi skilled worker and 47.01% are unskilled worker. Source: Bureau of Manpower, Employment and Training. In 2007, of the expatriate labor force, 0.08 % were engaged professionals and skilled 20 % & semi skilled 22% and 58% were unskilled workers. It has been observed that most of the expatriates are working in Saudi Arabia, UAE, Kuwait, Oman, Malaysia and Singapore. Besides new employment of opportunities have also been created for Bangladeshi workers in Bahrain, Qatar, Jordan, South Korea, Brunei, Mauritius, Italy and other country. It is seen from Pie chart that in 2007 the expatriates Bangladeshi in Malaysia , UAE ,Saudi Arabia , Singapore and Bahrain were 21%, 17%, 16%,3 % and 1 % respectively. Population is the main consideration in Bangladeshi economy. Positive role of manpower is not rare in national economy among people burdened countries. By capitalizing human resource China, Taiwan, Korea, Japan has upgraded their position in world economy and it is also possible for Bangladesh. In that case/Side by side of agri and industry based development, through export of Manpower we can change the condition of our country. Exported people from Bangladesh are maximum rural people. This huge remittance help to upgrade the eco social condition of the village people, thus other member of the family get necessary capital, for education investment in agriculture and over all life standard of people increases. Moreover this labours carry goods like TV, Radio, clothing, when the return home which bring change in their life style. The Remittance also play an important role in the investment of the country and as a internal supply of money. By taking parts in skims of deposit and investment of the government non government Banks they play a vital role in the development of the economy of the country and themselves. At present the noteworthy side of this investment skims are. A. Non resident Foreign Currency deposit. B. Wage earners development bond. C. Non resident investors take account. Manpower export can play an important role in eradicating poverty. As because remittance work as a catalyst for achieving economic self sufficiency of the poor people. Other poor families get free from the clutch of local zamindars and modern business motivated NGOs. Besides this money help in upgrading rural agriculture education, health, culture and long term poverty eradication. The remittance play a vital role in keeping balance to the export and import. Because it is a huge source of foreign currency, the biggest sector , garments is under threat , In that situation besides building a competitive garments sector we must pay attention in manpower export . At present our national economy is largely dependent on foreign aid but such type of foreign aid bears no positive result on our national economy over and above. We are to shoulder unbearable foreign debt. At the context of prevailing circumstances remittance earned by the Bangladeshi workers in foreign countries is the only way to pay this huge foreign debt. A vast section of present population in Bangladesh suffers from unemployment problem. Every year millions of people from Bangladesh migrate to foreign countries in search of employment and thus the recurring unemployment problem of the country is some how reduced. Labours working outside the country on the one hand mitigate self- unemployment problem at the same time, other members of their family get rid of financial crisis. Lately small industries are growing from earned foreign currencies to solve the unemployment problem inside the country. 1) implementation of money laundering act. 2) extension of Bangladeshi drawing system with many foreign exchanging houses. 3) supervise intensely the activities of drawing system of Bangladesh and concerned foreign banks. 5) assure investment of the people abroad in different sector. 6) instant steps to be taken to ease problems of the labours and holding discussion with diplomats. 7) the government will introduce a strict system to monitor manpower-recruiting agencies so that none of them could cheat people seeking employment abroad. The government has already taken action against some of the agencies for wrongdoings, misconduct. Punitive action was also taken against some officials at the Bangladesh High Commission in different countries. A ‘One-stop service center’ has been constructed with all the facilities to expatriate workers. This service center has all the facilities for expatriates like passport, immigration, hotel and restaurant, medical center community center, accommodation, selection of workers and pre departure briefing etc. Two welfare desks have been established at ZiaInternationalAirport for facilitating safe arrival and departure of the wage earners. 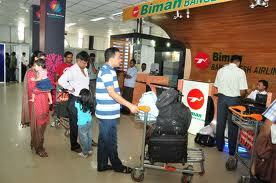 Welfare desk have also been set up at ShahAmanatAirport, Chittagong and OsmaniInternationalAirport, Sylhet. The convicted labours will not be permitted to go abroad anymore. Their name, passport no etc. will be sant to related organizations like BMET. BIARA and law enforcing agencies. Remittances have been playing important role for the socio-economic development of their respective countries over the last two decades. According to the report of” Economic and social survey of Asia and Pacific, 2006” published by ESCAP shows that in 2005, developing countries have received US$176 billion remittances which is more than double of the foreign aid received by those countries. In fact, remittance flows in 2005 was US$ 232 billion all over the world. Three of the five biggest remittances in flow countries are in the ESCAP region. These are: India (US$ 21.7 billion), China (US$ 21.3 billion) and Philippines (US$ 11.6 billion). Other major remittances in flow countries of this reason are Bangladesh, Pakistan and Sri Lanka. Beside a huge number of un-skilled labor force, skilled, semi-skilled and professional manpower is also available for foreign employment. In analyzing data we see in recent years Bangladesh has exported remarkable number of manpower in different countries and thereby earned handsome remittance which has strengthened our economy. Yet a huge number of Bangladeshi labours are illegal. They are financially hampered by the recruiting agencies. They knew nothing about job before going abroad. They are living subhuman life becoming the victim of cheating. Govt. has also faults. Training is essential before labours go to job market. Maximum labours do not know the language of the country they go so they become suffers. The govern ment will introduce strict system to monitor manpower – recruting agencies so that none of them could cheat people seeking employment abroad. Bureau of Manpower ,Employment and Training has already introduced computer based on line immigration clearance program . So it is expected that the number of illegal workers will be reduced. 1. Government has to protect the rights of migrant workers. Government has to try to sign more agreement with the recruiting countries. Proper initiatives have to be taken by concerned authority to sustain current labor markets and explore new markets. It is necessary to create a skilled manpower. Recruitment process would be transparent and fair. We should ensure the welfare of the expatriates. Inspire and encourage expatriates to send money through formal channel. We have to ensure reintegration of returned migrants economically and socially. We have to ensure that the migrant workers abide by the rules and regulations and observe and honor the customs and culture of the host country. 10. For the implementation of ‘Overseas Employment Policy’ the Ministry of Expatriates’ Welfare & Overseas Employment should ensure the infrastructure. Transparence and accountability in the overseas recruitment system will be developed and that will reduced the illegal opportunity for going abroad. The officials of the Labor wing of the Bangladesh missions abroad have been advised to visit the so working sites and camps on regular basis to sort out the problems of Bangladeshi workers with the employers. We have to adopt strategy which includes extension of the existing markets in the Middle-East, inclosing Libya, enhancing skills in the English language, exporting manpower from Mongo-affected areas, ensuring proper utilization of remittances, ensuring strong monitoring to clack fraud in manpower export, and working together with the World Trade Organization (WTO) and the international Migration Organization (IMO). (ii) Bureau of manpower employment and training. (iii) Ministry of Expertiates welfare and Overseas employment.